Fall is when grasses really shine. Black-eyed Susan (Rudbeckia fulgida ‘Goldsturm’) and firetail mountain fleece (Persicaria amplexicaulis ‘Firetail’) are good companion plants for many small grasses like this sapphire blue oat grass (Helictotrichon sempervirens‘Saphirsprudel’). From Landscaping Ideas That Work by Julie Moir Messervy (Taunton Press, 2014, page 160). Design by Stacie Crooks. Photo by Allan Mandell. How to Make an Entrance: Lighting! 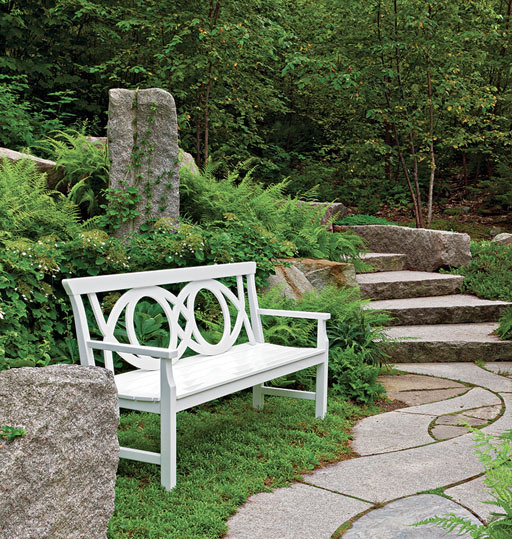 Landscape Design Tip: Back Up Your Seating!